LGBT Pride Month is celebrated in the United States every year in June. 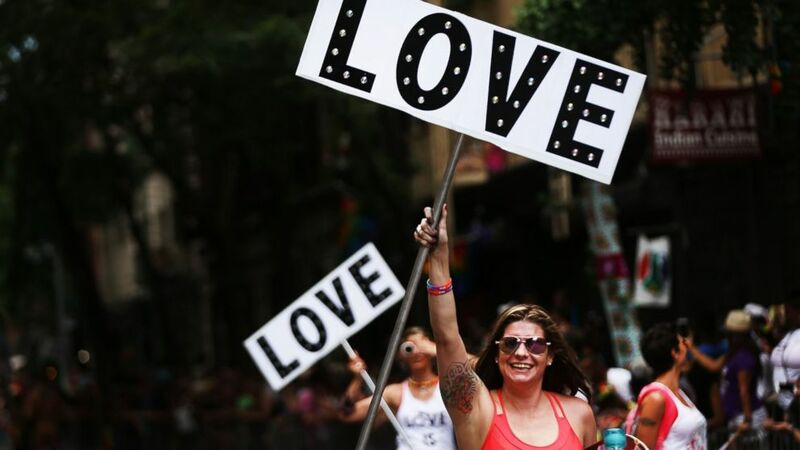 Every summer in the United States, the lesbian, gay, bisexual and transgender (LGBT) community and allies come together for a month-long celebration of love, diversity, acceptance and unashamed self-pride. (Spencer Platt/Getty Images) Participants in the annual New York Gay Pride Parade march in the West Village in Manhattan, June 25, 2017 in New York City. LGBT Pride Month is celebrated every year in June, with a series of events and parades taking place across the nation. 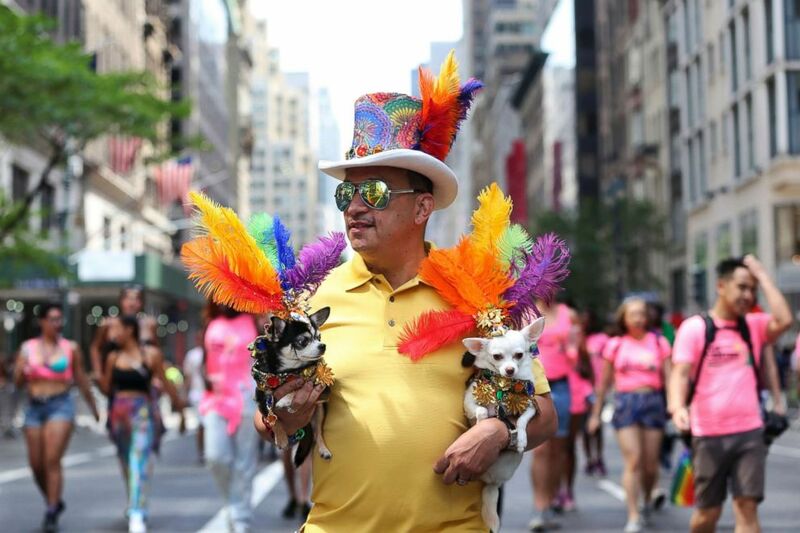 (Mel Evans/AP Photo) Anthony Rubio holds onto his costumed dogs as he walks along Fifth Avenue during the New York City Pride Parade, June 26, 2016, in New York. Why is it in June? The month of June was chosen for LGBT Pride Month to commemorate the riots held by members of the LGBT community against a police raid that took place at the Stonewall Inn in New York City on June 28, 1969. The so-called Stonewall riots were a "tipping point" for the gay liberation movement in the United States, according to the Library of Congress. The uproar also paved the way for the modern fight for LGBT rights. Previous presidents of the United States have, on several occasions, officially declared June as LGBT Pride Month. 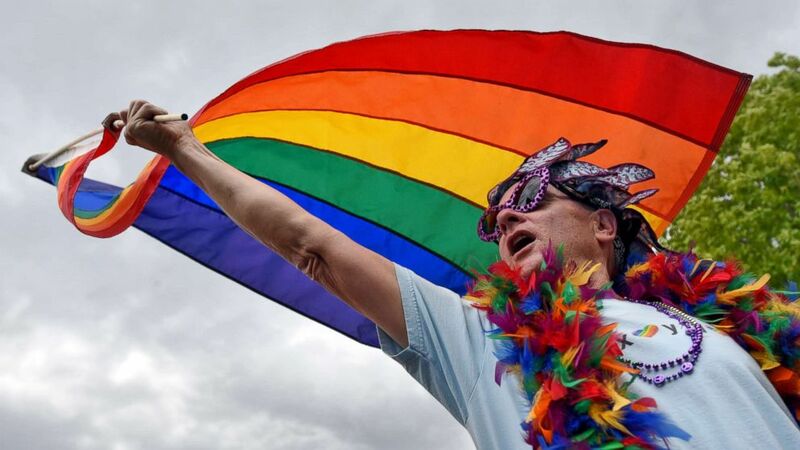 (Adam Eschbach/The Idaho Press-Tribune/AP Photo) Ahley Newman, of Boise, waves a rainbow flag during the Boise Pride Festival, June 18, 2016 outside the Idaho State Capitol Building in Boise, Idaho. community. How do people celebrate LGBT Pride Month? LGBT Pride Month events draw millions of participants from around the world each year. Today, the month-long celebrations include pride parades, marches, parties, concerts, workshops and symposiums across the nation. Memorials are also often held for members of the LGBT community who have lost their lives to hate crimes or HIV/AIDS. The rainbow LGBT flag is prominently displayed throughout the month. Gilbert Baker, an American artist, gay rights activist and U.S. Army veteran, created the flag in 1978 as a new symbol for the gay and lesbian political movement, at the suggestion of his friends and colleagues, including Harvey Milk, a San Francisco city supervisor and the first openly gay elected official in California. Milk was assassinated later that year. According to Baker's website, the colors of the LGBT flag each have a meaning: red for life, orange for healing, yellow for sunlight, green for nature, blue for harmony and violet for spirit. Baker died at the age of 65 on March 31, 2017, though his rainbow flag remains an iconic, powerful symbol for LGBT pride. (Maite H. Mateo/VIEWpress/Corbis via Getty Images) Thousands of people take part in the annual New York Gay Pride Parade in Fifth Avenue on June 25, 2017 in New York. Where will LGBT Pride Month events take place this year? A slew of official events will be held in various cities across the nation throughout the month of June. Here are some of the more prominent celebrations. The 2018 LA Pride Festival will be held in West Hollywood Park on June 9 and 10, beginning at noon local time. Singers Kehlani and Tove Lo will headline the event, along with a diverse lineup of other musicians and performers. The 2018 LA Pride Parade will take place on June 10, starting at 11 a.m. local time along Santa Monica Boulevard in West Hollywood. SF Pride will host two days of community engagement and entertainment at the Civic Center Plaza on June 23, starting at noon local time, and on June 24, beginning at 11 a.m. local time. The SF Pride Parade will take place on June 24, beginning at 10:30 a.m. local time along Market Street. SF Pride's official VIP party, Under the Rotunda, will be held at City Hall on June 24 at 2 p.m. local time. The Pride Luminaries Brunch will take place at David Burke Kitchen on June 17 at noon local time. OutCinema, a three-day event celebrating LGBT pride and community on film, will have specially curated screenings followed by Q&As and open-bar after parties at SVA Theatre on June 18 at 6:45 p.m. local time. The LGBT Community Center's Garden Party at Hudson River Park's Pier 84 will feature a diverse selection of tastings from restaurants around New York City on June 18 at 6 p.m. local time. Family Movie Night, one of the only free NYC Pride events for families and children, will show Disney's "Beauty and the Beast" at Hudson River Park's Pier 45 on June 19 at 6:30 p.m. local time. NYC Pride and God's Love We Deliver will host a fundraiser, Savor Pride, where renowned LGBT and ally chefs will cook five different dishes while providing in-depth demonstrations, discussions and tastings on June 21, starting at 6 p.m. local time. The NYC Pride Rally will take place at the historic Stonewall National Monument on June 22 at 5 p.m. local time. NYC Pride weekend kicks off in leather with a night party, Fantasy: Leather Edition, at Slate on June 22 at 10 p.m. local time. NYC Pride will host its first Cosplay event aboard a sunset cruise that embarks from Hudson River Park's Pier 40 on June 22 at 7 p.m. local time. The VIP Rooftop Party will be take place with plenty of dancing and spectacular views at Hudson Terrace on June 23, starting at 2 p.m. local time. NYC Pride's largest female identified event, Teaze HER, will be held at The D.L. on June 23, beginning at 5 p.m. local time. NYC Pride's Masterbeat event will transform the legendary Hammerstein Ballroom into a mega-club on June 23 at 10 p.m. local time. Tove Lo and Kylie Minogue will be among the artists performing for this year's Pride Island at Hudson River Park's Pier 97 on June 23 and 24, beginning at 2 p.m. local time. LGBT youth and their friends can enjoy interactive experiences, games and entertainment at Youth Pride at 14th Street Park on June 23 at noon local time. 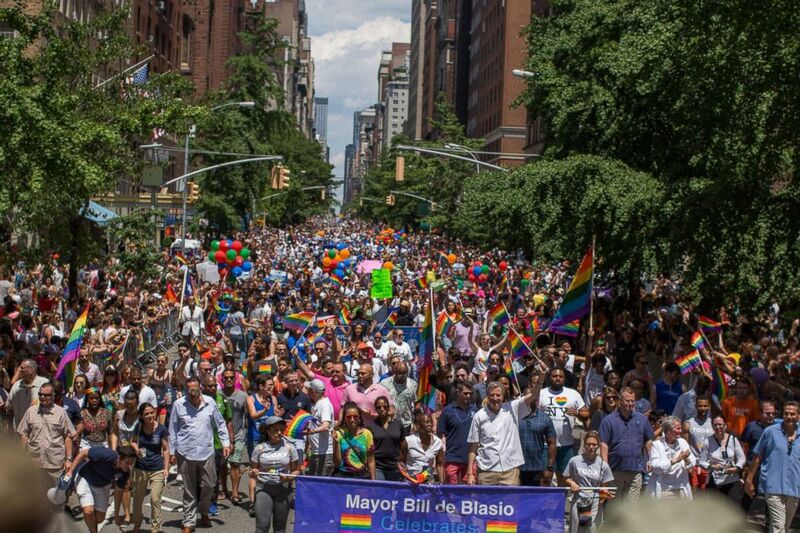 The annual NYC Pride March on June 24 will begin at 7th Avenue and 16th Street at noon local time. PrideFest will ring in its 25th year as the annual LGBT street fair at University Place between 13th Street and Waverly Place on June 24 at 11 a.m. local time. Women can eat, drink, dance and mingle during Femme Fatale, the exclusive rooftop party for women, at Hudson Terrace on June 24 at 4 p.m. local time.